Tales from a summer camp...: The Search for the Mysterious Chilazon: Has it Finally Been Discovered? The Search for the Mysterious Chilazon: Has it Finally Been Discovered? Please Note: This article was written in 2007 by my father, Rabbi Eli Teitelbaum Z"L, after Camp Sdei Chemed was given a private tour of the Ptil Tekhelet Association and the boys were able to search for the Chilozon in the Mediterranean Sea. For more recent developments I would suggest reading this new book, The Rarest Blue: The Remarkable Story of an Ancient Color Lost to History and Rediscovered . I decided to post this article now as it's in this weeks Parsha, Parshat Terumah where we learn about the tekhelet for the first time. The Search for the Mysterious Chilazon; Has it Finally Been Discovered? The mitzvah of Tzitzis is equal to all the other mitzvos in the Torah says the gemara, yet for more than a thousand years the blue thread that the Torah tells us to put onto the corners of the garment has been missing. That’s because the thread must be colored with a blue dye coming from a sea creature called a chilazon whose identity we don’t seem to know. This sea creature was obviously very well known in ancient times but was probably forgotten when the Jews went into exile to Bavel. This dye was very important in ancient times since it was used by kings and princes to dye their robes. It seemed to have been a very expensive dye literally worth its weight in gold. The Torah in Parsas Zos Ha’bracha) tells us that the tribe of Yisachar and Z’vulon were given the ocean which contained “treasures buried in the sand,” which the gemara in Mesechta Megillah (6a) says refers to the chilazon and other treasures found in the ocean. The gemarah (Menachos 44a) also says that they would “come up” only once in seventy years. While it was well known that the Mediterranean coast was the center of the dyeing industry in ancient times, the source of this dye has remained a great mystery. It seems to be that with the Arab conquest of Eretz Yisroel in 639 CE, the secret of tekhelet was lost and forgotten. Luckily, the gemara tells us that the blue thread is actually a separate mitzvah and therefore we still get the mitzvah of tzitzis even though we are missing the blue thread. However, we unfortunately do miss out on the very great mitzvah of having the blue thread. We first find techeles used in the making of the Mishkan. Rashi tells us in Parshas Terumah that it came from the blood of a chilazon and its color is (yarok) green. This seems rather strange, since it is generally accepted that techeles is blue and not green? From the gemorah’s description in Mesechta Shabbos (85a) it seems that the chilazon has a hard shell and one is not permitted to break it open on Shabbos. This would seem to indicate that it’s some kind of snail and not a fish. The medrash (Psiktah d’Rav Kahana 11:21) also describes it as a creature who’s nartek (meaning shell or housing) grows along with it, which is of course a snail. The gemorah (Bava Metzia 61b) also tells us that one had to be very wary due to those who tried to cheat you and use an artificial coloring called Kalai ilon, which looked identical in color to techeles. In fact the color was such a perfect match that there was no way anyone could tell them apart. And since as we all know, when there is some money to be made there are always plenty of cheats and frauds, people had to be very careful to make sure that the blue dye came from the chilazon and not from kala ilon. Kala ilan has been identified as indigo which is a blue dye of vegetable origin. (See the Aruch and the Radvaz Responsa 2:685). The gemorra also tells us that this blue dye would hold fast and not fade away by washing etc. And so while the search for the mysterious chilazon probably went on for many years, its identity remained unknown. It would have to fit all the above requirements in order for us to make a positive identification. It was first in 1887 that the great gaon Rabbi Gershon Henoch Leiner, also known as the Radziner Rebbe began an intensive search for the lost chilazon. He in fact went to visit an aquarium in Italy to study the many species of fish in order to see if any of them fit the description. He finally came up with a fish called a cuttlefish (Sepia officinalis, a type of squid). An Italian chemist showed him that by adding some iron filings to its blood and heating it, it would make a blue color. His conclusion however was met with great skepticism as many refuted his findings. In fact, by using his method, virtually all organic substances would also make a blue dye. Another problem was that cuttlefish are quite common, cannot exist in sand, and the ink is certainly not expensive to produce. Furthermore, a cuttlefish does not have an external shell but only an internal shell which does not have to be broken in order to get to the ink. Obviously the Rebbe had been misled by an unscrupulous chemist. The pros and cons can be found in the many seforim on this subject. In 1913 the Chief Rabbi of Ireland, Rabbi Isaac Herzog who later became the Chief Rabbi of Israel did much research on the subject and in fact wrote his doctoral thesis on this subject. His findings seemed to suggest that it is a type of snail called Murex trunculus which is indeed found in the Mediterranean. While his findings seemed to be correct, he ruled it out for a number of reasons. Firstly, the dye of the trunculus is purplish-blue and not pure blue. Secondly, the dye is not really permanent and thirdly, its body color did not look like the sea but rather light brown. Little did he realize that he may actually have discovered the mysterious chilozon but was unfortunately missing some very important facts and details. His first problem was that he didn’t know how to make the dye properly. It had to be made in the sunlight. At first the dye looks green just like Rashi describes it. It’s only when its held up to sunlight that it turns into a beautiful blue. I’ve done it many times and in fact have video taped the process. It’s absolutely remarkable to see how the green changes to a beautiful sky blue when held in sunlight! This important fact was actually discovered by Professor Otto Elsner of the Shenkar College of Fibers who had noticed that on cloudy days the dye seemed to turn purple while on sunny days it turned into a brilliant blue. His second objection that the dye doesn’t hold up well is incorrect. If properly prepared with chemicals used to treat wool to absorb the dye, it is extraordinarily fast. When tested in a strong bleach solution for more than three days it remained just as before. Perhaps he had tested the dye in a cotton fabric that does not absorb the dye very well. His third problem which was with the snail’s color has a simple answer. The snail that Rav Herzog had in his possession probably came from some local museum and its outer shell had been cleaned off. Had he taken it out of the water and seen it in its natural habitat, he would have realized at once that it looked just like the sea. In fact, this is why they are so difficult to find. I’ve taken my Camp S’dei Chemed campers chilozon hunting on the beaches of the Mediterranean many a time and they have learned that they are not easy to find. They hide in the sand and look the very same color as the sea. Perhaps the reason it was so expensive is that it takes about 30 of these murex trunculus snails to make enough dye for the four threads needed to make one pair of tzitzis. It is interesting to note that in 1858 the French zoologist Henri de Lacaze-Duthiers discovered three mollusks in the Mediterranean which produced purple-blue dyes and which he believed must have been the source of the ancient royal blue color. Interestingly enough, thousands of the Murex trunculas shells as well as the remains of a dye factory have been found near Sidon. The shells of these snails all have been cracked open on the very spot from which one takes out the (hypobranchial) gland from which one makes the dye. This is a sure sign that they were once used in the dye process. And so while the evidence identifying the Chilazon as the murex trunculus is quite strong, we are still missing something known as a mesorah. We find that we only eat birds for which we have a mesorah. And even though they may have the three signs mentioned in the gemarah as being kosher birds, we still do not eat them. That’s because there is always the very slight possibility that we may be wrong and therefore may be eating non kosher food Yet one wonders what harm there can be if we would at least put on an additional pair of tzitzis or talis after we make the bracha on our regular one, having this one in mind. Being mekayem this great mitzvah is certainly worth the chance! Rav Leiner states in his Sefer Ayan Ha’tscheles that the curse given upon those who use kla ilan in their tzitzis and claim that they are wearing techeles only goes on those who intend to deceive others and not on those who are really trying to fulfill the mitzvah. But we will leave this question for rabbonim to decide. Please note that this article was based on the research done by Dr. Boruch Sterman, Dr. Ari Greenspan, Rabbi Eliyahu Tevgar and the many excellent seforim on this controversial subject. In no way does it express any halachic opinion on this subject since this is the job of rabbonim. It was only written to inform you of the latest developments on this most intriguing subject. I certainly feel it’s something to look into! I myself wear murex dyed tzitzis, as I feel it's either fulfilling a mitzvah or wasting money. That said, this essay is flawed. 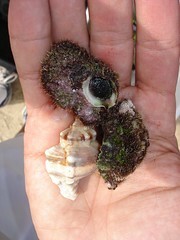 Let's says the murex trunculus is the source of royal purple, but not of dye for techeiles. That would explain the murex shells among dye vats in the region of Sidon. And the uncleaned murex trunculus shell does look like the sea bottom, but so does every bottom-dweller's shell. If that's what chazal meant, it wouldn't be an identifying feature. And translating "yam" as the seabed rather than the sea itself is a chiddush. In the other direction, the comparison to birds is flawed. Because requiring a mesorah is specific to the kashrus of birds. (And then explain to me the mesorah for turkeys.) Even within kashrus itself, if we found a mammal that had split hooves and chewed its cud, it would be kosher without a mesorah. So it seems that despite R' Chaim Brisker's position, it is more common to trust the evidence without mesorah. But... as for the "no loose" proposition, one would need to follow the Rambam and only dye one half of a string (ie one of 8) on each corner. 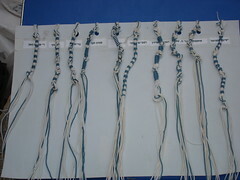 Dying a string that is suppose to be lavan something other than the literal white (Tosafos) or the color of the garment (Rambam) creates an inferior but valid tzitzis. No one said the strings worn in compensation for not having tekheiles have to be any particular color. So, if one dyes strings only because it can't be worse, that is only true if one takes a minimal position on how many strings are instead of the tekheiles. If you dye a full string (Raavad) or two full strings (Rashi, Tosafos), the Rambam would say you could behind over not trying to dye anything. Thanks for your comments. I am not going to respond as I'm not an expert on the subject and the author, my father, is no longer with us. I'll leave your comment up for others to see though.